Hello ladies...I hope all of y'all had a wonderful weekend and were able to stay "cool" in this summer heat. I spent Saturday with my girls in Birmingham...did some shopping and picked up Haley's wedding dress for her bridal pics that she will have made on the 15th. Sunday was spent making and addressing invites for her bachelorette/lingerie party that is being given by her maid of honor and that would be her little sister Mary Claire. A weekend at the beach with all the girls, now doesn't that sound like a lot of fun? Get this...I'm not invited...yes the MOB will be staying home...just where I belong...way too old for this type of weekend. We also started addressing the wedding invites and I'm very pleased with how they are looking (thank goodness). 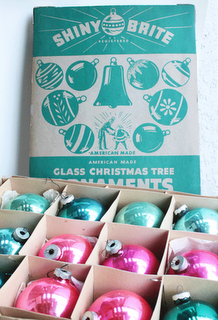 So are you wondering what thrifty ideas or treasures I have to share this week? I used some cute palm tree invites for the party that I found at a garage sale about a year ago...they were only $2 for a box of 50. The second thrifty idea I'm sharing today is...we are printing all the addresses and names for the wedding invites on our printer...Haley went with a beautiful font...so why pay for a calligrapher when you can get the look or less!!! I wish I could share the invites with you, but for privacy reasons, I better not. Okay now all of y'all know what I've been doing...let's now here what you have been doing...join the party and let's all have a good time here at NTT! Oh my...I almost forgot to announce the WINNER of that cute Ribbit the Frog Scentsy Buddy...the WINNER is Susan from Susan's Hearts and Flowers...congrats Susan and thank you Tracy for donating this cutie pie! Here are a few of my favorites from last weeks party. Now Karen...this is just my style!!! She also found these beauties! she found this beauty in a local thrift store. That chair looks amazing Linda!!!! I love it. Hi Lind! Hoping the heat has let up a bit! It is 101 here today! Thanks for always being the gracious hostess! Thanks, Linda, for hosting the giveaway and another great link party! Great inspiration Linda! Thanks for the party!! The 25th isn't that far away anymore...creeping up fast and things are getting crazy!! Thats great thrifty ideas regarding the invites! Thanks for hosting Linda and I hope you are having a wonderful week so far. Post that address so all of us mature girls (aka ancient!) can crash that bachelorette party!!! Is the wedding dress just gorgeous??? Thank you so much for hosting Mrs. Linda!!! I hope you are trying to stay cool!! Thank you for the feature, Linda! Hi Linda, I know the wedding plans are fun and it sounds like you have great ideas. I also enjoyed the featured photos and posts. Happy wedding and happy looking for those thrifty buys. I think the MOB should be invited to the party, and the MOG, even if discreeting also requested to leave before the wild fun begins. I have no idea any more what wild fun is like, but I also know you could handle it. They just don't want to picture their mom being one of the girls at a lingerie party. 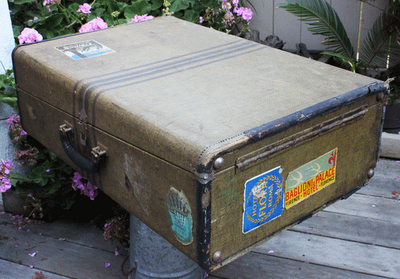 i love that old suitcase with the stickers, that's a great find. you guys are moving right along with all the wedding goodies-my sil did the same thing with her invitations-and they looked just as good as the ones i know people paid a lot of money for! i think that's a great and thrifty diy. Linda, thank you again for hostessing! It's an awfully hot summer to be planning a wedding! I hope everything goes well and there will be a few cooler days for you! Thanks for hosting the party!!! I love the new chalk board paint. I am also liking the vintage suitcases. I'm new to your blog hop and love it! I look forward to stopping by next week and the week after that and so on. Great blog and thanks for hosting. It sounds like a great weekend Linda! Maybe the MOB can have her own party with some of her friends! ;) How fun that she is doing a photo shoot too, she will be beautiful! Thanks for hosting the party! The wedding will be here before you know it. I don't blame you for using the printer to address invitations. Calligraphy is so expensive. Stay cool and try to enjoy all the little details. Thanks for hosting...It has been almost 100 degrees the past few days so I am a little late with my contribution. The heat is really getting to me. It should not be this hot in NJ in June!